This is awe-inspiring. 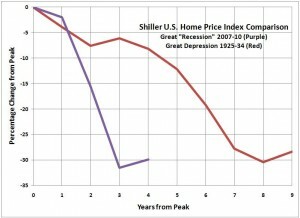 Based on data compiled by Professor Robert Shiller of Yale University, this real estate decline has been just as deep as the one before and during the Great Depression. But the current real estate decline has been far more rapid, accomplishing the same 30% price decline in three years that played out over eight years during the Great Depression. No wonder the U.S. banking system was insolvent. And no wonder the Federal Reserve has taken such extreme measures. By the way, while I was warning how severe this decline could be, I had to listen to real estate brokers and salespeople here in Miami and Coral Gables claim that I had it wrong. One prominent broker repeatedly accused Professor Shiller, who was also very bearish, of being not only wrong but dishonest, because Shiller has an interest in a firm that makes a market in options that track real-estate prices. It was a disgusting display of ignorance and intolerance. Wonder how many customers that broker’s firm ushered into personal financial hell. Be careful whose counsel you keep. posted by // This entry was posted on Sunday, December 19th, 2010 at 6:25 pm and is filed under Financial Responsibility, Real Estate Market Data. You can follow any responses to this entry through the RSS 2.0 feed.